The Mountain Scops Owl is a small scops owl with short, blunt wings, and short ear-tufts. 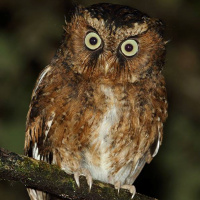 It is also known as the Spotted Scops Owl. Typical call, male - Bhutan © Dave Farrow. Typical call, male - Taiwan © Wayne Hsu. Description: There are many different colour morphs, as well as considerable individual variation in colour. 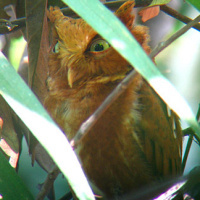 The facial disc is rufous-brown with conspicuous bristles. The bristly feathers are pale at the base and tipped blackish. The eyes are golden-yellow or greenish-yellow. The bill is pale horn-coloured, whitish, or wax-yellow. Ear-coverts and cheeks are barred blackish, while the collar is whitish or rufous-buff with obscure bars of blackish and dark brown or blackish tips. The forehead and sides of the crown, including the short ear-tufts, are sometimes paler and buffish, with the crown having many pale rufous spots edged with black that often broaden on the hindneck and back into bars. Upperparts are dark tawny-brown or rufous-brown, vermiculated with blackish. Inner scapulars form a prominent row of feathers with clear white outer webs and bold black tips. The median wing-coverts are usually boldly marked with buff and black. The primaries are barred rufous-brown and dark brown. The tail is rufous-brown with blackish bars mottled and broken by chestnut bands. Underparts are whitish, barred rufous with small triangular paired black and white spots. Tarsi are densely feathered up to and often over the base of the toes, which are whitish to pale flesh, or fleshy-brown. Size: Length 18-20cm. Wing length 129-152mm. Tail length 65-89mm. Weight 53-112g. Habits: The Mountain Scops Owl is a nocturnal bird, starting its activity during and after dusk. Frequents deep and shady gullies and ravines, foraging in the lower parts of the densest forest trees. Voice: The male's song is a relatively high-pitched double whistle - "whew-whew" or "plew-plew", with 0.5-1 seconds between notes. The female's song is seldom heard, and is a single soft note in response to the male's call, with their songs finally becoming a duet. Hunting & Food: Feeds mainly on insects such as beetles and moths. Probably hawks insects in the air, and hunts below the canopy or near the ground. Breeding: Northern races breed from March/April to June. Nests are holes in dead trees, usually a large, natural hole, but sometimes an abandoned nest hole of a woodpecker or barbet. Holes chosen are usually from 1.5-7.5m above the ground. Usually 3-4 (sometimes 2-5) eggs are laid directly on the cavity floor. They are pure white, roundish, have a smooth texture and are about 32 x 27.6mm. The female incubates the eggs alone, while the male supplies the food. 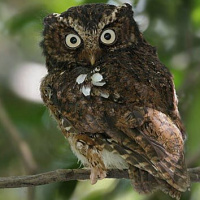 Habitat: The Mountain Scops Owl is confined to humid forest. In the north of its range, it frequents temperate hill evergreen forest of oak, pine and chestnut. In the south, montane tropical rainforest (also partly containing chestnut and oak). Lives and forages in the lower parts of very dense vegetation of trees and scrubs, preferably within tall primary forest or its fringes. Usually ranges from about 600m to 2600m above sea level, mostly above 1200m. Distribution: Pakistan, Nepal, and Himalayas in north and east India to Sikkim and Burma, southeast China, Taiwan, south to southeast Asia, Malay Peninsula, Sumatra and Borneo. Status: Locally frequent to common.